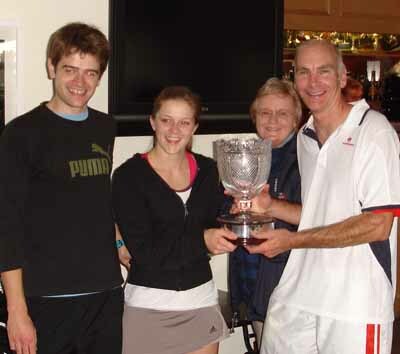 Telford Park Lawn Tennis Club won the Millennium Cup for the fifth time in the competition’s ten-year history when its team defeated Wigmore Lawn Tennis Club on Saturday 17 September by six points to three. On a difficult day in terms of playing conditions, the conclusion of the 2011 inter-club contest went down to the wire and was decided just as the rain arrived at Wigmore, the host of this year’s final. The Millennium Cup is a pretty unique event in that it was conceived to provide a friendly, competitive environment between members of the five local clubs of Streatham, south London. The idea is to encourage new members into match play under friendly conditions and more experienced players who already compete in the Surrey league are discouraged from playing under a Standard of Play criteria devised by the Organising Committee on which representatives from each club serve. “It has proven to be a popular and successful format involving all ages,” said Barbara Wancke, the Millennium Cup Tournament Director and Chair of the Organising Committee. The first point of the day went Wigmore’s way when Pierre Galez impressively overcame Guy Tillson in the tricky wind, 6-2 6-1, in the Boys Under 16 Singles. Playing alongside was the Men’s Open Singles between Telford’s Mathieu Lacourx and Wigmore’s Claudio Soares, which was destined to go the full distance, as were the two pairs in Women’s Doubles. Both matches lasted a good two hours and were closely fought. Wigmore’s Cary Alder and Caroline Strachan eventually outran Telford’s Sara Clarke and Brigid Clarke, 4-6 6-3 8-6, in a match that was played in a wonderful spirit, putting the hosts up 2 points in the tie. The men were locked in a fine battle that saw Soares take the first set on a tiebreak, only to be levelled by Lacourx who forced the decider in which the Frenchman romped home to victory, 6-7 6-3 6-0. Meanwhile the Women’s Open Singles contestants had been on court for a while, and both found the conditions difficult. It took Telford’s Melissa Canavan a set and a half to get used to the artificial clay court and her consistent opponent, Wigmore’s Marelene Russell, whose ability to scoop the ball back into court was quite remarkable. Canavan began to find her range and came back from a first set deficit to win the next two and garner Telford a valuable second point, 4-6 6-4 6-2. With the points balanced at 2-all, the Girls Singles got under way, closely followed by the Men’s Doubles. Nathasha Cox’s left-handed forehand proved the decisive weapon in the girls’ contest, and she was the steadier against Sharleen Hussey, winning 6-1 6-4 to put Telford ahead 3-2. Wigmore immediately struck back with a convincing win in the Men’s Doubles from Damien Hing and Gavin Pereira over Tim Clarke and Jamie Scott, 6-3 6-2, levelling the tie at 3-all. Telford’s Sarah Mawby took the first set easily in the Women’s 40 and Over Singles but had a fight on her hands in the second from Celia Edwards. She survived the scare and came through 6-1 6-4 to put Telford ahead 4-3. With all to play for, the two remaining matches took to court as the weather deteriorated and the conditions for play became even trickier. Wigmore’s mixed pair of Alexandra McAdam Clark and Neil Dowden put in a fine effort but were pegged back by Alice Hamilton and Mathieu Lacourx, 6-2 6-3, who clinched the tie in Telford Park’s favour. In the Men’s Over 45 Singles, Telford’s Keith Lavender recovered from 1-5 down to take the first set against Adrian Crawford and went up 3-0 when the heavy rain set in and the match was abandoned. Murray Sutton, Chairman of Grafton LTC responded on behalf of all the clubs participating in the competition – Grafton, Norbury Park, Telford Park, Wigmore and Woodfield Grove: “I’d like to thank Barbara for running the Millennium Cup for the last 10 years and to acknowledge all the work she has put into making this such a success. It has now been won five times by Telford Park, while Wigmore, Grafton and Norbury Park have each won it twice. Contact details can be found in the rulebook on page 19.